Join us for a DH lunch with Stephanie Boluk and Patrick LeMieux on Wednesday, April 25th, 2018. Boluk and LeMieux are joining us from UC Davis where they teach English and Media Studies respectively. 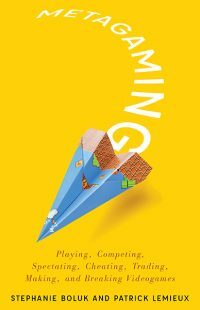 They recently published Metagaming: Playing, Competing, Spectating, Cheating, Trading, Making, and Breaking Videogames and will be speaking on video game culture and pedagogy. Boluk and LeMieux are here at the invitation of Prof. Andrew Ferguson who is teaching a course on video games in the English Department this spring.